An arrest has been made in the attempted robbery and knife attack on the store owner of Vana Watch and Jewelry in South Pasadena on 12-14-18. 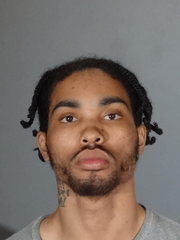 Omar Teriq Bradley (see attached booking photo), a 21 year-old resident of the City of Compton, was arrested driving the vehicle used in the crime by Los Angeles County Sheriff's Department Compton Station deputies on Tuesday, December 18th. Bradley will be arraigned today in Alhambra Superior Court on charges of attempted robbery and assault with a deadly weapon. If you have any information regarding this case, especially the identity of the second suspect, please contact SPPD Detectives at 626-403-7280 or submit an anonymous tip to LA Crime Stoppers at 1-800-222-8477.